The Pianokids™ curriculum includes a Lesson Book, a Funtivity Book, Flashcards and more, all to be used in conjunction with Pianokids.com. 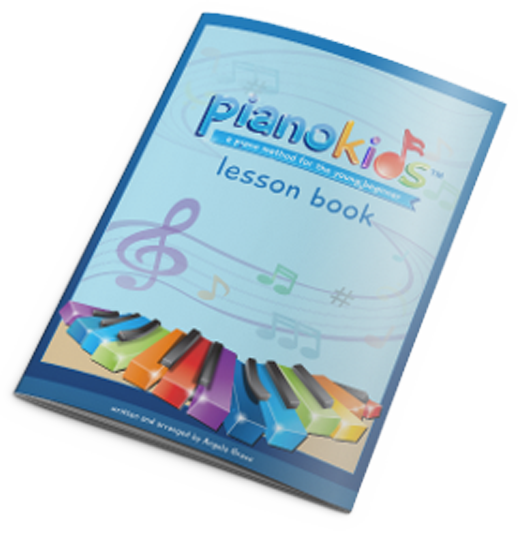 The Pianokids Lesson Book is the heart of the program. It details the unique Pianokids approach, which makes learning to play the piano truly fun! It also explains the underlying concepts to you—so you can be the teacher! The Funtivity Book is an activity book that's fun! There are entertaining stories to read, things to trace, draw, and color, all relating to the Lesson Book songs. As children go through the funtivities, the lessons learned at the piano become almost impossible to forget! Flashcards are another fun way to reinforce each lesson learned. The Lesson Book will tell you when and how to use the flashcards with your child. The Coloring book pages follow the Pianokids characters to an exciting adventure at the beach and supplement the Lesson Book after your child starts playing with two hands. We include a custom-made pouch containing five markers and five crayons in the Pianokids colors to ensure you have the exact colors you need for the lessons. Don’t worry, the markers are washable — and they smell good too! Playing piano is a physical activity, so a squeeze ball is included to help strengthen your child’s fingers. Naturally, it comes in the same basic colors taught in the lessons. Encourage your child to practice (and build responsibility and accountability) by letting them place stickers on our special calendar for every day they practice. Seeing the stickers add up as the practice days go by is a great motivator to continue practicing. We've provided twenty-four lesson plans that coordinate all the materials, so you never have to worry what your child should be focusing on. Plenty of ideas are included that keep the learning fun! The Pianokids.com website is full of resources for you and your child, including a Virtual Piano Teacher, video lessons, accompaniments, and more!